She organized the first event, in November 2014, and is thrilled to do so again. It is inspired by the international Empty Bowls effort. Diners are asked to make a minimum $10 donation and get soup poured into the bowl. They receive bread and drink and then can take home their unique ceramic bowl. The bowls are washed and returned to the buyers to symbolize the battle against hunger around the world. All proceeds will benefit the Circle U program in Richmond, which provides about 1,300 meals per week to needy people, according to director Eric Weiss. The first Empty Bowls event was held off campus on a Saturday in November 2014, with all 250 bowls being taken within the first hour. “We’re having it (at IU East), so more of the campus community can come,” Longley says. There also will be a limit this time on one bowl per person. The suggested $10 donation is kept low so students can afford them, Longley says. Of course, those who wish to donate more to support the cause can do so. The unique ceramic pieces are handmade through a multiple-step process – molded by hand, fired, glazed and fired again. The pottery pieces will include those donated by five artists from around the area. 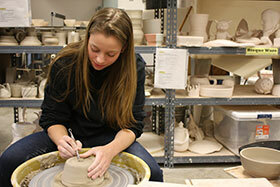 Most are the work of 40 ceramics students from IU East. “They have been making them since last semester,” Longley says. Her students surprised her last week when they worked late into the night to help meet a deadline for starting bowls for the project. A new event this year offers the public the chance to help put the final glaze on the bowls. The Glaze-A-Thon is scheduled from 10 a.m. to 2 p.m., on Friday, March 11, in Tom Raper Hall Room 116. Participants will see many finished products in a variety of colors on the shelves in the studio where students work. Longley has reached out to area restaurants and cooks to donate soups and plastic ware for the event. Area restaurants including Café at Twelve Hundred at Reid Health, The Tin Lizzie, Chef Donnie at the Holiday Inn, Little Sheba’s and The Den at IU East will be contributing their best soups for the event. “The soups will be very good,” Longley says. IU East students and employees again have volunteered to staff the event. When: 5-7 p.m. on Thursday, March 31. Where: Whitewater Hall Lobby, IU East. Cost: $10 includes soup, bread, drink. Participants can choose their own bowl and take it home, while they are still available. One bowl per person. Glaze-A-Thon: The public is invited to help put on the final glazes on works from 10 a.m. to 2 p.m., on Friday, March 11, in Room 116 of Tom Raper Hall.